My name is Drew Domkus, I was born and raised in Burbank, California in the 70’s and have been skateboarding for as long as I can remember. Skating curbs on narrow trucked GT skateboards was all the rage as a kid and getting across the full width of your front yard could get you to the top of your skate crew back then! 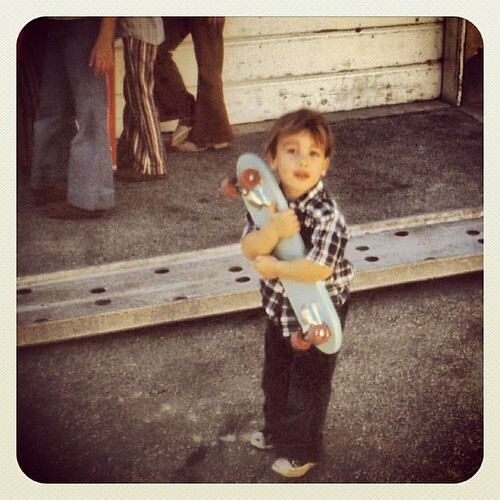 As the trucks and boards got bigger and skateboarding became a real thing, I tried to keep up as best as I could. Growing up where it was all happening helped of course and so half pipes, empty swimming pools, ditches and the streets were the terrain. Burbank was an early adopter in making skateboarding illegal and I even got a ticket for just pushing in the street once. We found ways around that of course. I skated so much that I came down with mono from not taking care of myself when I was around 17. Looking back I regret not getting back onto a board right away, but other things in life caught my attention and I never really considered myself good enough to try to get sponsored or become pro or anything like that, so I stopped… that would have been around 1988. Fast forward to 2010 and I’m living in the Costa Rican jungle and there’s a skate park called Concrete Jungle right down the road from where we’re living, and they’ve got a mini half pipe! As soon as I dropped in and realized that I could still grind and do rock and rolls, I was properly hooked again on this awesome form of self expression. I’m living back on our farm in Wisconsin now, I turned 40 in October of 2011 and decided it was finally time to build my own skate space since I now have plenty of room. That started with a 4′ tall, 8′ wide mini ramp and today it’s been upgraded to 16′ wide with a 4′ wide section that goes up to 5′. I’ve also got some space for a cement park behind the barn where the wood park is. I post lots of photos and videos, so please enjoy! I also started a company called Old Dude Skate Co. in July of 2016 for all of us old skater dudes out there!